The ugly and not-so-distant history of slavery, of post-emancipation Jim Crow laws and lynchings, and of legalized discrimination and segregation all cast a long shadow. Indeed earlier this year a United Nations committee concluded that racial and ethnic discrimination – including police brutality – remain persistent and pervasive problems in the United States. A half-century after the civil rights movement’s hard-earned victories in the face of widespread repressive opposition, racial disparities continue to be striking and sobering. African Americans live in poverty at rates almost three times those of whites; this difference is even greater when specifically comparing the percentages of children living in areas of concentrated poverty. White median household income is nearly double that of African Americans, and the median wealth of white households is twenty times greater. African Americans are unemployed at twice the rate of their white counterparts and their life expectancy is approximately five years less. Today, sixty years after the Supreme Court struck down “separate but equal” in Brown v. Board of Education, the early gains in the desegregation of U.S. schools have largely disappeared and the racial gap in college graduation rates has not narrowed. Deeply troubling race-based imbalances are also present throughout our criminal justice system. Compared to white Americans, African Americans are much more likely to be the target of “stop and frisk” operations and related racial profiling tactics by law enforcement; to be arrested for offenses such as selling illegal drugs (even though their white counterparts engage in comparable criminal activities just as often); and to receive longer average prison sentences for identical offenses. Altogether, African American men are incarcerated at rates more than six times greater than white men, with one-third of all African American males likely to be imprisoned sometime during their lives. For white males the corresponding figure is only one in seventeen. These inequities persist at an institutional level even as explicitly racist beliefs and overtly racial discrimination have become increasingly taboo. Racial injustices remain closely related to economic and educational disadvantages, disadvantages that are disproportionately borne by African-Americans – largely because centuries-old institutions of racial oppression have not received sufficient structural redress. In our economic system, many African Americans and other people of color are denied desirable employment opportunities or even jobs that pay a living wage. In our education system, schools in deeply segregated urban neighborhoods are underfunded and overcrowded, and higher education is unaffordable for most students. Rather than increasing safety, zero tolerance policies have maintained and exacerbated a “school-to-prison pipeline” that ensnares a disproportionate number of young people of color. Psychology plays an important role in the social forces perpetuating individual and institutional racism. Because of the link between race and class, the psychological mechanisms that perpetuate class injustices also tend to perpetuate racial injustices. The widespread preference to see the world as just, for instance, leads people to embrace narratives that blame those who struggle with socioeconomic disadvantages – disproportionately people of color in the U.S. – for their own plight. This perception then dampens the popular will to support a role for elected governments in setting reasonable minimum standards of economic rights, fostering a political culture that greatly harms working families of all races. Other psychological mechanisms relatively independent of class also reinforce racist attitudes and actions. Negative cultural stereotypes of African Americans are pervasive and entrenched, in part because of a psychological inclination to unconsciously legitimize status quo disparities. Even when these stereotypes are overtly rejected, they often persist at the level of implicit biases, which by definition are “activated involuntarily, unconsciously, and without one’s awareness or intentional control.” These biases not only serve as the foundation for intentional expressions of prejudice and racial violence but also for unintended yet harmful micro-aggressions, which often cast African Americans as deserving of fear, distrust, and disrespect. Too often, inaccurate and biased news reports and media portrayals further serve to reinforce perceived differences of the racial “other.” At the same time, stresses associated with disproportionate suffering from class injustices, with being treated as “second-class” citizens, and with being targets of discrimination increase the likelihood of negative physical and psychological health outcomes for African American children and adults. The structural racism that permeates our society is also both a product of and a contributor to other deep-seated and largely unconscious individual psychological processes such as moral disengagement and moral exclusion. Members of one group don’t just adopt stereotypes and prejudices and engage in hostile and discriminatory ways against members of another group. They often also develop ways of reasoning that allow them to behave harmfully towards members of the other group without feeling guilt or shame. Mechanisms of moral disengagement such as dehumanizing the other, blaming victims for one’s aggression against them, minimizing the consequences of one’s harmful behaviors, or reframing harm in a positive light (e.g., freeing a community of its dangerous elements) allow people to behave inhumanely and still view themselves as moral individuals. Moral exclusion is a related set of cognitive processes whereby members of other groups are viewed as belonging outside the prevailing scope of justice. In this way they are deemed as appropriately excludable from concerns with moral and human rights considerations, and as not deserving of protections from a wide variety of harms, ranging from deprivation and exploitation to genocide. Meanwhile, so-called “colorblindness” – often proposed as a solution to racial injustice – can, in practice, make people of color “invisible” and contribute to maintaining existing racial inequities by overlooking or denying structural injustices and the pervasive unearned advantages and privileges typically afforded to those who are white in the United States. Not surprisingly, given that white Americans have the privilege of shutting themselves off from the realities of racial inequality, a large gulf exists between African Americans and white Americans in perceptions of the extent to which equal justice prevails in the United States today. And while white Americans tend to emphasize how much better off African Americans are now than they once were, African Americans are more inclined to focus on how much further we still need to go to achieve racial equality. At the individual level, learning more about the hardships, abuses, accomplishments, and resilience that characterize the long struggle against racial injustice can provide a pathway to better understanding the current circumstances, adversities, and structural violence that need to be overcome. Working to recognize and transcend our own biases is also essential; for some, this may begin by participating in challenging conversations about race, even when those interactions are uncomfortable. It is also important for all of us – including those in positions of influence and advantage – to demonstrate solidarity with the direct victims of racial injustice through concrete engagement in advocacy and other forms of collaboration. In many workplaces and volunteer organizations, there is a need for a stronger commitment to specific actions aimed at increasing diversity and promoting respect for differences, especially in the ranks of leadership. 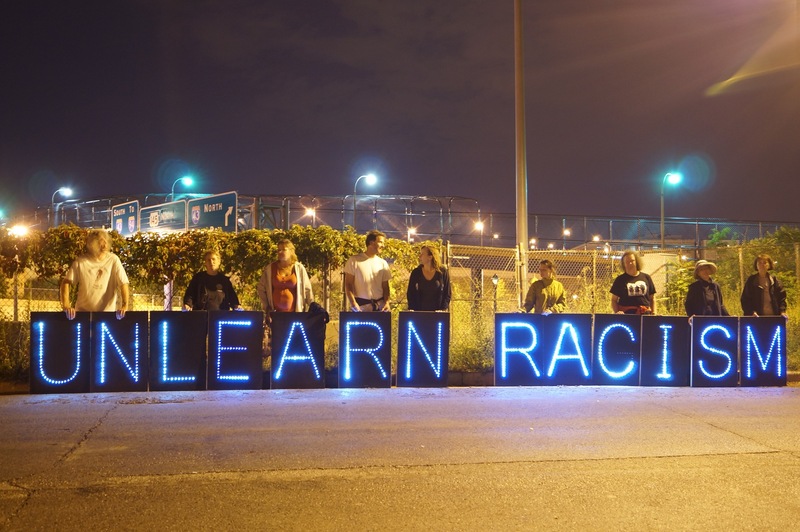 Where appropriate, public service and other organizations – including police departments – should adopt training programs that demonstrate how contemporary racism operates, including how implicit bias works and how it might be consciously overridden. Policies and procedures assuring that instances of workplace racism and discrimination are recognized, taken seriously, and addressed directly should be instituted as well. In some contexts, sustained, dialogue-driven learning opportunities can be more effective than strictly punitive responses in reducing racist and discriminatory behavior and building a culture of acceptance and mutual respect. In our schools, teachers and other educators should receive support in developing the skills and educational materials necessary to make both historical and contemporary racial injustice an integral part of the curriculum and restorative justice a first option when disciplinary problems arise. As a nation, we must all commit to joining together to transform the entrenched systems that, almost invisibly at times, obstruct progress toward racial equality. Toward that end, genuine intercultural, pluralistic living – rooted in horizontal, intentional, and cooperative engagement – can help to further foster respect and empathy across boundaries that too often divide people from each other. But fifty years after the Civil Rights Act was signed and Martin Luther King, Jr. received the Nobel Peace Prize, it is clear that much work remains to be done. The urgency is undeniable. Building a more racially just society is the shared responsibility of all of us. The authors wish to thank Derek Allen, Jamaal Bell, Trudy Bond, Amira N. Davis, Marilyn Glater, Ian Hansen, Brian Jones, Leslie King, Kimberly E. Walker, and Lawanda Wallace for valuable discussions and editing assistance. Roy Eidelson is a clinical psychologist and the president of Eidelson Consulting (link is external) where he studies, writes about, and consults on the role of psychological issues in political, organizational, and group conflict settings. He is a past president of Psychologists for Social Responsibility (link is external), associate director of the Solomon Asch Center (link is external) for Study of Ethnopolitical Conflict at Bryn Mawr College, and a member of the Coalition for an Ethical Psychology (link is external). In recent years his writing and advocacy work have focused on two areas: first, ethical concerns raised by organized psychology’s increasing involvement in U.S. military and intelligence operations, and second, how “the 1%” use psychological appeals to issues of vulnerability, injustice, distrust, superiority, and helplessness in order to preserve their power and wealth. Roy can be contacted at reidelson@eidelsonconsulting.com (link sends e-mail). Mikhail Lyubansky is a member of the teaching faculty in the Department of Psychology (link is external) at the University of Illinois, Urbana-Champaign, where among other courses, he teaches an upper-level undergraduate course on the Psychology of Race and Ethnicity (link is external) and a graduate-level practicum course on restorative justice. Since 2009, Mikhail has been learning, facilitating, evaluating, and supporting others in the U.S. in learning about Restorative Circles, a restorative practice developed in Brazil. In addition to multiple book chapters and more than a dozen articles in peer-reviewed journals on topics such as racial identity, undocumented immigration, and restorative justice, he blogs about these and related topics in his Psychology Today blog Between the Lines. Mikhail can be contacted at lyubanskym@gmail.com (link sends e-mail). Kathleen Malley-Morrison is a professor of psychology in the Human Development Program, Boston University. She is lead author (with Denise A. Hines) of Family Violence in a Cultural Perspective (Sage, 2004), co-author of Family Violence in the United States: Defining, Understanding, and Combating Abuse (Sage, 2005), and editor of International Perspectives on Family Violence and Abuse (Erlbaum, 2004). She also assembled and edited a four volume series on State Violence and the Right to Peace, the International Handbook of War, Torture, and Terrorism (with Hines and McCarthy), and the International Handbook of Peace and Reconciliation (with Mercurio and Twose). She has a blog, http://engagingpeace.com (link is external), and a monthly e-newsletter, Choosing peace for good. Kathie can be contacted at kkmalley@comcast.net (link sends e-mail). We use the term “African American” as a way to both acknowledge the unique history of trauma and oppression experienced by individuals who were taken from Africa and brought to America as slaves and highlight the continued disparities and inequalities faced by generations descending from this population. Our linguistic choice is not intended to suggest that we value any less the histories, perspectives, and contributions of those who prefer to self-identify differently. As well, we recognize that other people of color and members of marginalized groups are also disproportionately subject to mistreatment in the United States.